Like the albatross glimpsed in the beginning of this 10-part, 5-volume series, The Life of Birds quickly takes flight. Sir David Attenborough hosts this unprecedented and extraordinary global look at the magnificent and often curious winged species with which we share our planet. Like the best wildlife shows, The Life of Birds offers a fresh and accessible view of creatures we may take for granted (didn't Alfred Hitchcock warn us about that?). The focus of this series is not on the different bird species, but on bird behavior. Remarkable and awe-inspiring footage preserves the wide range of tools and techniques with which birds fly, hunt for food, attract a mate, hatch their chicks, and defend themselves against predators. One of the best bird documentaries! If you love birds, you'll love this. The camera angles were awesome. Now, my only bad remark about the series. The DVD video quality. It is VHS at best, and looks like a Divx hack of some movie... not that I would know what one would look like. If you LOVE BIRDS, you'll LOVE this 3 Disc Collection! My hubby & I enjoyed watching this three disc dvd collection about the life of birds, which is narrated by David Attenborough. There are ten, roughly fifty-five minute segments, dedicated to specific topics regarding the life of birds around the world..... Some of the topics include finding a mate, building nests and rearing young, to various bird calls/sounds, and the challenges birds face living in extreme environments are just some of the topics discussed. This is very worth the investment. We'll watch it many times as the years roll by. Bird Lovers - Watch This! Exactly what we expected from Attenborough! My wife and I bought The Life of Birds from Amazon without seeing a minute of it. We had seen The Life of Mammals and Blue Planet enough times that we both felt confident that we knew what we were getting. We were right. The only reason I gave it four stars instead of five is that I can't quite say it was as good as Blue Planet, which blew me away. Based on our previous experience with The Life of Mammals and Blue Planet, what were we expecting, you might ask? Well, first of all, we knew we'd be getting an outstanding nature documentary series featuring a dizzying variety of animals. We were also expecting informative, yet not overly intrusive narration from David Attenborough. Last, we were expecting a series that our 2-year-old would be riveted to and want to watch over and over again, which is what happened with the first two series. As I said earlier, that's what we expected and that's what we got. Don't get me wrong: I enjoyed Winged Migration. But as far as documentaries go, it really is a different bird (if you will). The Life of Birds is engaging in a way that Winged Migration is not - it strives to teach, not to create art. The footage may not inspire quite so many "How did they get that shot?" moments as Winged Migration, but there are plenty of scenes that make you wonder. Add to that the fact that there are so many bird species from all manner of habitat in this series that you'll lose count after the first installment. TO FLY OR NOT TO FLY: Features computer animated sequences on the origins of flight and how birds evolved from pterasaurs - very similar to that in Walking With Dinosaurs. Also great footage of birds hunting insects, including a bee eaters, kiwis, and a hornbill. THE MASTERY OF FLIGHT: An in-depth look at the anatomy of flight featuring albatrosses, pelicans, hummingbirds, snow geese and various birds of prey. There's a great scene where an osprey nabs a trout, picks it up and turns it head first in mid-flight to reduce drag. THE INSATIABLE APPETITE: Deals with the constant search for food, largely as a result of flying being so energy-intensive. Features woodpeckers, sap suckers, geese, lorikeets, hornbills, crows, robins and macaws. MEAT EATERS: Deals almost exclusively with birds of prey, such as owls, eagles, kestrels, shrikes, and hawks, as well as a few that you wouldn't expect (vultures and flamingos). Amazing flight footage in this episode, and very much feels the same as those documentaries of lions eating zebras in Africa. FISHING FOR A LIVING: Pretty self-explanatory title, featuring dippers, ducks, skimmers, kingfishers, gulls, cormorants, herons, cranes, albatrosses and assorted shore birds. SIGNALS AND SONGS: A detailed analysis of the reasons and ways that birds communicate. Features robins, blackbirds, finches, hummingbirds, woodpeckers, bell birds, toucans and a whole bunch of birds whose names I'd be sure to misspell if I tried. FINDING PARTNERS: You can't talk about mating birds without talking about peacocks, right? Well, they did. However, there are grebes, Jamaican streamer-tailed hummingbirds, red-headed weavers, an odd-looking pheasant, a Scottish grouse, the calf bird (which moos to attract a mate) and hedge sparrows. THE DEMANDS OF THE EGG: Looks at the hassles birds go through to protect their eggs, including a close look at nesting. Features terns, dippers, frigate birds, warblers, weaver birds, red-breasted toucan, cuckoos, and imperial pigeons. THE PROBLEMS OF PARENTHOOD: Deals with the non-stop effort of feeding some demanding kids that bird parents seem to go through. The young bird footage is great. Features Australian Rosella parrots, coots, cuckoos, Andean torrent ducks, red geese, Arabian babblers, and open billed storks. This is the 6th entry in the David Attenborough Life series following The Private Lives of Plants. The groundbreaking first series Life on Earth was based on evolution and started with bacteria making its way up to modern humans over the course of 13 episodes. The Living Planet was 12 episodes long and dealt mainly with adaptation over a wide range of environments that also incorporated more Earth science along with the life science in terms of geology and environments. The Trials of Life was 12 episodes long and all about animal behaviour. Life in the freezer was 6 episodes long and specialized on the Antarctic. The Private life of Plants was another 6 episode series and focused entirely on botany. With Life in the Freezer and The Private Life of Plants Attenborough made a new move to specialize instead of following the 12-13 episode discipline that started with Clark's Civilisations and Bronowski's The Ascent of Man and birthed other great series like Sagan's Cosmos, Attenborough now decides to detach from the shorter episode format of Freezer and Plants (an such as was in previous non-life series such as The Tribal Eye, The First Eden and Lost Worlds, Vanished Lives) and goes for a higher number of 10 instead of 6 instalments on another expert theme. Attenborough concentrates on one animal kingdom, the birds, and it's a real wildlife bonanza with many moments to leave you speechless. While The Private Life of Plants was a somewhat still, though time-lapsed voyage, because they don't move very far very quickly, the Life of Birds is on the opposite end of the spectrum with birds darting around frequently to the point where slow motion is needed to see what just happened for the `blink and you miss it' moments. In this series Attenborough maybe visits more places and countries than all his series put together. Some of it though was covered before in Life on Earth, but you still want to see it again. Since birds do a lot of singing sound is of primary importance as much as the visuals, maybe even more so. This show literally turns your living room into a nature park with its superb audio. There are some sequences involving domesticated birds that have been imprinted and they can perform on cue, so you get some amazing shots, like birds flying with the camera. There is some CGI done for birds that are now extinct. Major themes include when to fly and when not to fly, the mechanisms of flying, finding food, meat eating birds, fishing, bird signalling, finding mates, egg laying, parental care and endurance. A must for your Kids Collection! ...or dvd compression, or whatever. Beyond the rather grainy/fuzzy look to a lot of the episodes, this is David Attenborough's opus to his favorite animals, the birds. Well, I can't be sure they are his favorite animals, but it would seem that way from his treatment of them in this and several of the other 'Life' series. OK, perhaps a second complaint might be that we've seen a little of this before with 'Trials of Life', but unlike 'Life of Mammals' that alternatively feels too recycled or stretching too hard to find the weirdest thing we've never seen (IE the Golden Mole), 'Birds' gets right down to its lessons in Ornithology. Not that it's anywhere near as brainy as Life on Earth--I'm pretty sure nature lovers of any age will dig it--but it doesn't go for flash the way 'Blue Planet' (admittedly only narrated by Attenborough) or 'Mammals' does. Common species do the job of telling the story Attenborough has for us just as well as the species from the 'wind-swept plains of patagonia'. With the stylistic flourish paired down, Attenborough's love and enthusiasm for avians shines through and we get something that all the special infra-red cameras and weird post-editing couldn't accomplish. Ultimately, 'Life of Birds' is both informative and enduring, while Attenborough's continued arguments for conservation and preservation of species will fall silent on only the most unfeeling viewers. If Attenborough's goal was to establish a sense of marvel toward a group of animals we often take for granted, he has accomplished this and perhaps a little more. Having watched several bird videos lately (the dramatic documentaries March of the Penguins, Winged Migration, and Pale Male, as well as the fictionalized Fly Away Home), and having recently become aware of the variety of birds in our neighborhood, I finally got around to watching David Attenborough's excellent Life of Birds. As entertaining as all the other videos were, Life of Birds is by far the best of the flock. As you begin to watch the series, it isn't long before you appreciate the amazing camera work, as well as the amount of patience involved in waiting for just the right shot. And with the amount of film that was shot, editing must have been a monumental chore as well. But what an incredible result. You get so close to the birds, and observe so intimately their behavior, that you may begin to grow pinfeathers. I had never seen David Attenborough before watching Life of the Birds, though I was aware of his reputation. For the first episode or two, I thought he was a bit quirky, bouncing around as he talked, wearing funny hats in cold weather, popping up in every corner of the earth to catch birds in their native habitats. His enthusiasm is infectious, and it's fun to see him occasionally interacting with the birds - in one scene he actually helps steady a bird who loses its footing while running up a tree. He lounges among huge flocks of birds and the birds walk up to him as if to say "No need to worry, it's only David Attenborough." But Attenborough would not approve of anthropomorphizing the birds. He knows his science, and by the end of the ten-part series, you will too. There are no extras on this three-disc set. However, in one of the later episodes there is a short section about the filming of the series. One cameraman spends all night in a precarious treehouse so that he can film his subjects at sunrise. There is a storm and lightning breaks off one of the brances of the tree the camerman is perched in, but fortunately not the critical branch. The shots he got in the morning were spectacular. There are not enough "STARS" that could be award to this remarkable DVD set. I once thought, "Birds" were for the Birds", THIS "Life of Birds" DVD set, is truly NOT for the "Birds", BUT it is for ANY humanbeing that loves and requires the best (almost unbelievable)VISUAL experience possible. The only suggestion I offer, is to make sure you view this on the best "State of the Art" TV that you can afford (or borrow) and you WILL experience a visual experience like none other. It is a 3 disk set and it is about 3 hours of viewing of each disk. If you become affected (mesmerized) as I had been, you would probably want to keep this particular DVD set in a "safedeposit box", so that you can add an amendment to your "Will", bequeathing this particular DVD set to those that loved you the most. They may forget about you, but they will never forget the visual experience you have left them. May you have an long life and as long as you live and re-play this DVD set,your life will only be embellished. The information in the video is very interesting and educational--but the video quality looks terrible on our HDTV! One of the reasons I purchased it was because I was expecting it to be similar in video quality to Planet Earth. It definitely isn't. I hope someday they will release a version that looks better than these DVDs. This is the BBC at its best. Further, it's Attenborough at his best too. The quality of the production shines through. It's luscious, rich, vibrant and makes this one of the best TV series of is type ever made. This magnificent series makes you gasp in wonder at the sheer splendour and variety of birds on our planet. The photography and editing are first-rate. Attenborough's style is, as always, enthusiastic, knowledgable and supremely confident. David Attenborough simply makes the best nature documentaries available today. His style is thorough, witty, knowledgeable and avuncular; watching his work one feels as if one is being gently instructed by a kindly and brilliant long lost relative, eager to impart his understanding of and wonder with the world to those who will follow him. 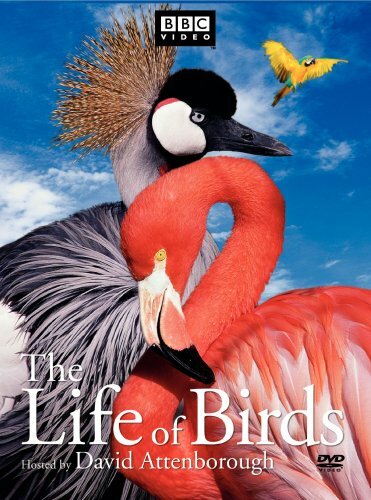 The Life of Birds is a truly excellent series, with extremely high production values, solid editing and a wide array of obscure trivia and arcana to interest the veteran avian enthusiast as much as the neophyte naturalist. I have never personally had any particular affinity to or affection for birds before viewing this series; I honestly picked it up to have more Attenborough to enjoy after burning through The Life of Mammals and The Blue Planet over the course of a few weeks. Despite my initial disinclination for the subject matter, I found the documentaries to be exceedingly engaging, so much so that within weeks I found myself and my somewhat surprised S.O. hiking around a nearby nature reserve searching for various indigenous species of marsh birds. However, the subject matter, however fascinating, is tested to it's limits of interest by the sheer size of the series. I hesitate to accuse Attenborough, but I feel that the subject matter could frankly have been handled in less episodes than are present in the series, or perhaps in shorter episodes. Upon reflection, however, I cannot think of any extraneous episodes or segments; rather, after the huge diversities of species covered in the tantalizing Life of Mammals and Blue Planet, I suspect the focus on the more subtly diverse avian kingdom was simply too narrow for my wandering and fickle tastes. In all, however, The Life of Birds is truly an excellent series, and I would recommend it unhesitatingly to anyone interested in increasing their own knowledge of the manifold wonders nature. While I have no real personal sense of what is or is not appropriate viewing for young children, one of my co-workers to whom I have lent several of the discs of the series tells me that his two pre-teen daughters enjoy the series very much. EXCELLENT!!!! We ordered it twice from Netflix, but it was too good not to own ourselves. So many INTERESTING facts....unbelievable information. This is just as good any documentary on single subjects and can give Blue Planet a run for its money. From the beginning, it is fascinating with both extraordinary graphics and amazing insight as to the life of birds. Even though it comes on multiple disks, you will be left wanting for more. Naturally, one of the mod important elements in this production is David Attenborough with his intriguing presentation stile and pacing. The only downside is that this documentary suffers from "yum yum eate'm up syndrome." The depiction of something being eaten is proportionally over emphasized; this distracts from the rest of the film. Just casting my positive vote to yet another of David Attenborough's great documentaries. How did they film it??? My wife and I have a long and strong interest in birds, with two pet sparrows, other close bird associations, and hundreds of hours soaring with raptors, ravens, swifts, gulls, and pelicans, on our hang gliders and paragliders. Birds have been the main focus of Naomi's artwork. So we expected to enjoy the series but maybe not find a lot of new or surprising information. Wrong! Most of the content so far has been new to us, either species we had never heard of or at least a different angle on the ones we did know something about. After renting and watching half of the first DVD, we ordered the whole set. This will be one of the few that we will watch, and show to friends, over and over. I can't speak directly for people who think they have no interest in birds, but that should be no deterrent. If you have any interest in the world around you, watch this video. The videography is breathtaking; narration is great; pacing, story interest, and organization are nearly flawless. Factual, technical, or editing errors are few and trivial. As someone with a long interest and a lot of knowledge in aviation and aerodynamics, I can say that this program gets it right and gets it across in ways that intelligent lay people will grasp in ways that will give them a whole new way of seeing the world around them. I can only assume that the same level of care has been given to less familiar sub-topics. Getting specialized knowledge across to lay audiences without dumbing it down or losing accuracy is a rare and precious art: The Life of Birds is a masterpiece. Attenborough is a charming guide, fun to watch and hear, and not too intrusive. Occasional computer graphics and animations serve a good purpose and are not overdone. There's little or no annoying overdramatization - who needs that when the material is so engrossing and compelling on its own? If video transfer quality on earlier DVDs or tapes was poor, that problem seems to have been solved. What we've seen is some of the most sparklingly clear video I can think of anywhere. About the only small gripe I have is that the menu navigation and links from one chapter to another are awkward and confusing. But that amounts to a minute or two of annoyance out of hours of pleasure. One reviewer mentioned missing topics such as bird respiration. Well, it would be nice to cover everything known about birds, but even in 10 hours of video it simply can't be done. And some topics are probably a better fit for books, such as The Sibley Guide to Bird Life & Behavior. We rented The Life of Birds with high expectations, and the program exceeded them in every imaginable way. This is my first of many reviews of David Attenborough's fantastic wildlife documentaries. After checking out "The Living Planet" from the library I quickly found out more about his work, and this was the first I came across. Seeing as how, long before I watched this I already had an enormous interest in wildlife, I was very pleased to learn loads of new facts (a common occurrence in Attenborough's programs) and even find out about species I had never heard of before! A plus to all this, is the presentation, the cinematography is incredible. (eagles flying towards the camera through trees, a king-fisher diving to catch a fish viewed from under-water) And of course David's narration and on-screen presenting is very engaging, he's very enthusiastic about the material he's delivering. On another note, the music is great and really fits well with the programs, and I often find myself whistling the theme after watching it. There really is only one small complaint, which is the same as many others, that being the video transfer. It's not as good as others in the "Life of" series but it is not too bad and you easily forget about it once you've started watching it. Most scenes still look very clear and sharp. Only occasionally does the picture get really fuzzy. When my husband purchased this three-DVD series, I asked him, "Are you really SURE you are THAT interested in birds to watch ten hours of programs about them ?" But from the first hour, I was hooked. Every single episode relates so many different, interesting facts. Some things I had wondered about for many years, and they were explained. I own everything David Attenborough has ever done -- I have the utmost respect for his work. Life of Birds is fascinating, well-composed, informative, etc. But the video quality (I have it on DVD) is absolutely dreadful. Grainy and washed out like very early digital video (I wonder if it was shot on digital video to make it easier to get some of the amazing footage he captured). By comparison, the look of Life of Mammals is breathtaking -- the composition of shots, color, lighting, and overall vividness is a hundred times better than Life of Birds. A Birds Life is Great!!!!!!! When I found out that BBC did a 10 hour special on birds, I flipped. When I got through only the first hour of material I can honestlt say that I did not expect such a thurough, involved, wonderful job to be done! WOW, go for it.The only thing is that not great is the case and packaging for it is not as good as "Life with Mammals." Too bad there isn't a six star rating. If you love birds you will learn a lot from this set. I love BBC's programs, but the quality of these DVDs is disappointing, and frankly offensive when you consider its high price. Just compare this against PLANET EARTH or BLUE PLANET and you will see what I mean. I suspect the problem may be that this particular set was licensed to Warner Brothers for DVD production, and they obviously didn't put any effort into it. PLANET EARTH and BLUE PLANET, among others, are not. Why they gave this to Warner I do not know. Perhaps they are recording an all-new bird series to replace it. I'm only halfway through the 3 DVDs, but I must say that this documentary is absolutely incredible. So many amazing facts, amazing footage, and all with the great hosting voice and skills of David Attenborough. This is one of my highest recommendations for anyone interested in birds, nature, or just seeing how many amazingly beautiful places one team can go just to provide an incredible take on the world's most beautiful creatures, birds. David Attenborough is the world's foremost and probably most well-known wildlife expert. He and his crew go to extraordinary lengths to capture footage of plants, birds, animals, insects, the earth never before seen, in each and every series they create. The resultant photography is always top-notch, the narration by Attenborough always succinct, appealing, and with a dash of under-stated English humor, and the documentaries extremely interesting. I have watched it over & over again, enthralled. I am not big on nature documentaries, but this has really reawakened my interest in the outdoors & living creatures. Life of Mammals is also excellent. The pacing is gentle yet interesting, the juxtaposition of the birds is stimulating. I have not gone birdwatching in about 10 years; after viewing this, I have not only resumed birdwatching, but I have a more intuitive way of looking at & appreciating the birds, which has helped me identify birds more quickly and accurately. Best nature documentary to date. Period. It is so very well done. This is 580 minutes of spectacular footage and riveting narrative. Sir David Attenborough is the supreme nature narrator and the BBC filmmakers are simply brilliant. I couldn't pull myself away from the screen. To see, up close and in perfect imagery, both the usual and the unusual life of birds, to see the vast range of species, habitats and habits... priceless. Bird behaviour is fascinating, even more fascinating than you can imagine prior to viewing this series. Even though there were some things I thought were missed, and even though there was something in every program that mildly annoyed me. With nothing really comparable, I still believe this is worth the top rating, simply because of the labor of love David Attenborough put into it. I also think there was not enough attention given to other crucial parts of birds' anatomy, like the unique respiratory system that allows them to cope with the oxygen demands of flight. Even the differences in "white muscle" of quail and red muscle of doves, for example, were not touched, and these would have given insight to why some birds are natural strong flyers while some are limited to short burts and spend their time mostly on the ground. Differences in talons and beaks, differences in wing shapes, IMO could have been better illustrated. And in both "Birds" and "Mammals" I really can't understand why David Attenborough would go great lengths to show the rarest of species while ignoring the obvious: chickens, dogs, cats, cows and horses. Just because these animals are domesticated and common in the backyard doesn't mean they're not interesting.